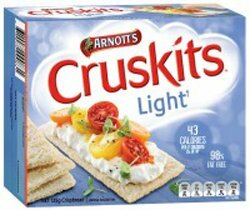 Lightly puffed and toasted with less than 1g fat and 43 calories per serving, Cruskits light make a healthy lunch or snack which can be loaded up with your favourite toppings. Wheat Flour, Rye Meal, Rice Flour, Sugar, Milk Solids, Salt. So good with vegemite! A great, crispy alternative to bread.